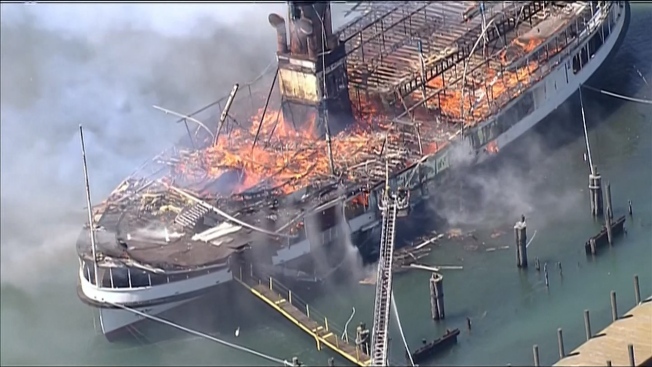 A large boat went up in flames at a Detroit marina on Friday, sending smoke wafting over the water. Video showed firefighters battling the blaze, which left the boat a smoldering hulk on the Detroit River. The boat is the S.S. Ste Claire, according to NBC affiliate WDIV. It had been used for many years to transport people to an amusement park on nearby Boblo Island, which sits on the river between the U.S. and Canada. It wasn't immediately clear what caused the fire. The boat was listed on the National Register of Historic Places in 1979 and named a National Historic Landmark in 1992. Launched in 1910, Ste. Claire and another excursion steamer, the Columbia, ran between Detroit and Boblo Island for 81 years, which was "a record of service on a single run unequalled in U. S. maritime history," according to the Michigan State Housing Development Authority. While the amusement park on the island had swan boats and various other rides, the Detroit Historical Society's Encyclopedia of Detroit reports, "For many people the best ride of the day was on the 'Bob-Lo Boat' that took visitors to the island."